Darryl Raymaker: REFLECTIONS ON LORD BLACK, 'LYIN' BRIAN, AND O.J. REFLECTIONS ON LORD BLACK, 'LYIN' BRIAN, AND O.J. What can one say about Lord Black of Crossharbours? Is he sane? Is he a martyr? Is he a fool? An idiot? A shyster? A crook? And what about the boy from Baie Comeau who, in the mean streets of his hometown used to charm and sing songs for Colonel McCormick, the wealthy owner of the Chicago Tribune? The one who became Prime Minister, Brian Mulroney? Is he sane? Is he a bit slow? Is he an idiot, shyster or crook? For certain they are both narcissists. They love the limelight. They love attention. They think primarily of themselves. They love mellifluous language, particularly when it is spoken by themselves. When each speaks, they themselves are their favorite subject. Fundamentally, they are both snobs. Ordinary people, unless they are people whose favour they may require to curry in the short term, are the flotsam and jetsam of life. Both love to consort with the rich, powerful and famous. Each loves the camaraderie found in the oak panelled board rooms, in the company of men of substance, captains of industry, and conservative movers and shakers. Corporate governance, to both, is clearly a nuisance. In Black's words it is "rubbish," and its spokespeople, fanatics. 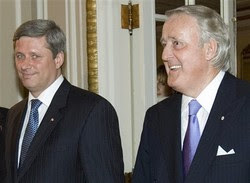 Mulroney, who has yet to be quoted on the subject, has displayed his disdain for the post-Enron movement by not stepping down from even one of his many lucrative Board appointments despite the disquieting, and now quite substantiated facts about his 'dealings' with a shadowy businessman who sought the favour of the Canadian government. Both then are narcissists. Indeed, even to the untrained eye and ear, it is evident that both probably suffer from a clinical 'narcissistic' personality disorder. In their own minds they can do whatever they wish. Because, as each might say, "Its all about me!" Watching Lord Black commit his very public hara-kiri, and Brian Mulroney blarney his way through the reasons for his inexcusable behaviour, brings to mind another celebrity who continues to be forever etched in our minds, whether we like it or not. 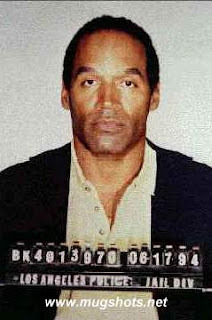 None other than the notorious Orenthal J. Simpson, formerly of football fame, but now, the quite infamous "O.J." as the North American pop world refers to him. Just as Mr. Simpson continues to effortlessly stumble or propel himself by design into public spectacles, so does Lord Black and Brian Mulroney. Most recently, Simpson allowed himself to be once again the subject of lurid headlines as part of a strong arm operation gone bad to retrieve what he says are his own personal items. The result is criminal charges of armed robbery, protestations of innocence and no doubt, another spectacular trial. This time he may be carried off in an orange jumpsuit for some time. But what the hell, as O. J. no doubt believes, "Its all about me." And what about Lord Black? He tweaks his tormentors, goads them, berates them, attacks them, libels them. Indeed he does all of this and more. Nonstop. Facing six and a half or so years in the slammer, he continues to needle the prosecution, the now-revered culture of corporate governance, and his unhappy shareholders who brought him down. Even his old pals, like William F. Buckley and Henry Kissinger - both fellow narcissists in their own right - do not escape his vitriol. Witness Black's column in today's National Post that trashed them both because of their incredibly luke-warm endorsements of his character in the sentencing process. 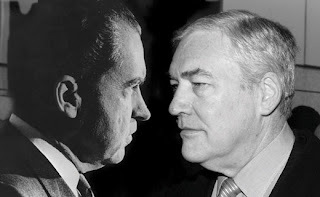 So whatever else Conrad Black may be - anti-social, psychopathic, arrogant bully (and he is that for sure), crook - he is a narcissist. They say there's a bit of the narcissist in all of us and that sometimes it is good. That may well be true. But there is a whole lot of it in Conrad Black, and - particularly now - it is not so good for him. Beyond that, as many have suspected, suspicions which have now been confirmed by the Trial Judge and Jury, he is also - - how can I put this - alas, a felon. One hopes he will see a shrink as well as the warden in the years ahead. And now for Muldoon (as that splendid muckraking rag 'Frank Magazine' calls him). The fact that he is a narcissistic and grovelling personality is beyond debate. Of course he is. The preening, the primping, the pandering to power, the public crooning of Irish ballads to the President of the United States, the indefatigable bowing and scraping and kow-towing to the likes George H. W. Bush, the society weddings, the corporate board appointments, yada, yada, yada. Yes, we know him well. And in the words of that great Canadian chronicler of the national condition, Peter C. Newman, "He bugs us still." But what of an ex-Prime Minister who, while still in office befriends and consorts with a sleazy and corrupt businessman who makes a living through bribing government officials? An ex-Prime Minister who agrees to take cash to lobby for this gentleman shortly after leaving office? An ex-Prime Minister who, shortly after leaving office, is paid $100,000 cash payments from the same sleaze bag on three different occasions in three different hotels? An ex-Prime Minister who takes that money and puts it in a safety deposit box, who spends at least part of the money, and only years later - only when things get hot - pays tax on the money? An ex-Prime Minister who does not appear to have rendered any service for that money and to this day has not rendered an account for any service, and who misled lawyers while under oath in a law suit by denying he ever dealt with the low-life when in fact he did? What about that? And add to all of that the fact that the three payments of one hundred grand each came from a Swiss bank account controlled by the (tsk tsk) gentleman which contained commissions he earned from Airbus industries for sales of airplanes to Air Canada he helped arrange through his political influence! Oh yes, and remember the lawsuit wherein Muldoon took the Government of Canada for 2.1 million big ones for a defamation, that may not have been a defamation at all. We know Mulroney is a narcissistic blowhard. But what else is he? The facts thusfar tell us that he may be a whole lot more than that. And that is something the people of Canada have a right to know. In other words, just who was their Prime Minister Brian Mulroney? The Commons Ethics Committee hearings continue. Surprisingly, there are many talking heads that are saying that we have learned enough. They say, let's get on with it - governing the nation, rising to new challenges, etc. After all, they say, both of them are liars - Schreiber and Mulroney - so what is to be gained by going further in the investigation? The Canadian people have a right to know about their Prime Ministers and if it takes a public inquiry into highly suspicious facts and circumstances, so be it. Equally, those who aspire to high public office in this country had better learn their limits - and their ethics. Bring on the public inquiry! NEIL WAUGH: C'MON ED, CHURCH HIM TOO.